On line 9, replace iphorm_1_1 with the unique element ID, from Step 1. On line 21, replace the number 400 with the maximum number of words you want to allow. If you want to make it so that the user cannot submit the form if they exceed the word count, you’ll need to add a custom validator. To do this, add the following code to the wp-content/themes/YOUR_THEME/functions.php file (or create a plugin for it). 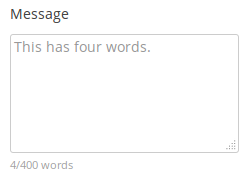 On line 3, replace the number 400 with the maximum number of words you want to allow. On line 11, replace iphorm_1_1 with the unique element ID, from Step 1. You can style the word counter, by adding the following CSS style to your site and customizing it to suit, see Adding custom CSS.